‘Tag! You’re it! A travel tag’ is a YouTube channel tag that I found over @ Travelling Natural. I don’t have a YouTube channel, or at least I don’t use the channel that I have, so I thought I would adapt the tag and do it myself! It’s a snapshot questionnaire about all things travel, so if you have a blog or a YouTube channel, please consider yourself tagged an join in the fun! Not only is this tag awesome and fun, but the original poster had a great idea to create threads and groups with people completing the questions. She hoped that the answers and the information could be used to help the travel community plan future trips, handing out hints and tips for everyone to enjoy. So, if you do take part and tag yourself then please make sure you tag her in it and link to the people you see complete this! Have fun! 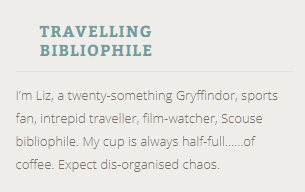 I feel like this intro, that is on the side of my blog, is a fairly accurate description. I am an avid reader and traveller, amongst other things, and have managed to make my passions my work as I now work in the travel sector too. 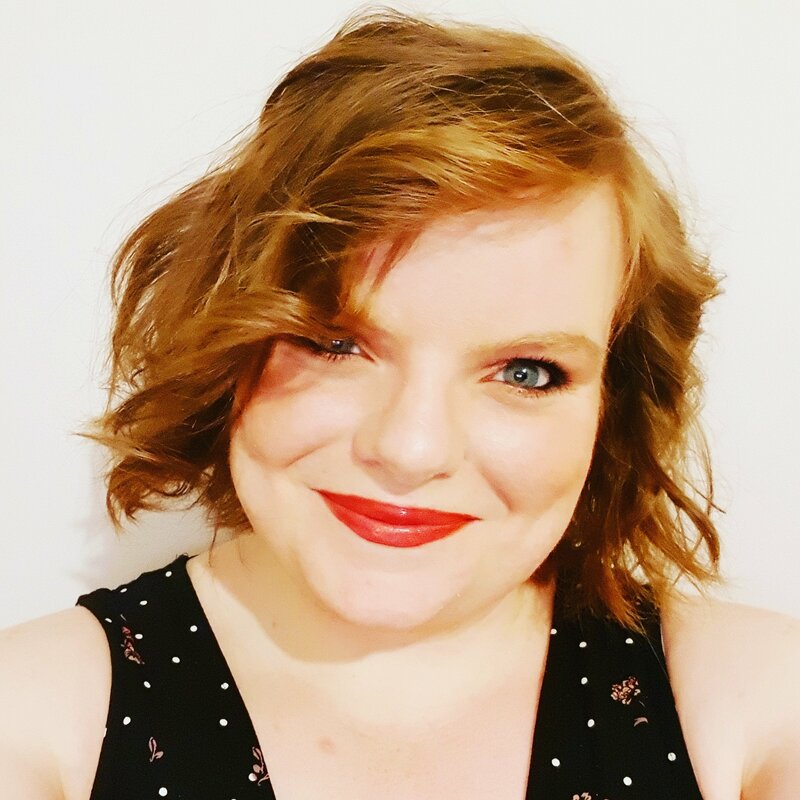 In addition to my blog, I like to share pictures and musings through my twitter: @LizHannah25, and my Instagram: @LizWhitehouse25, and I post about all things books and reading progress through my Goodreads. Please feel free to check them out, follow, like and comment! 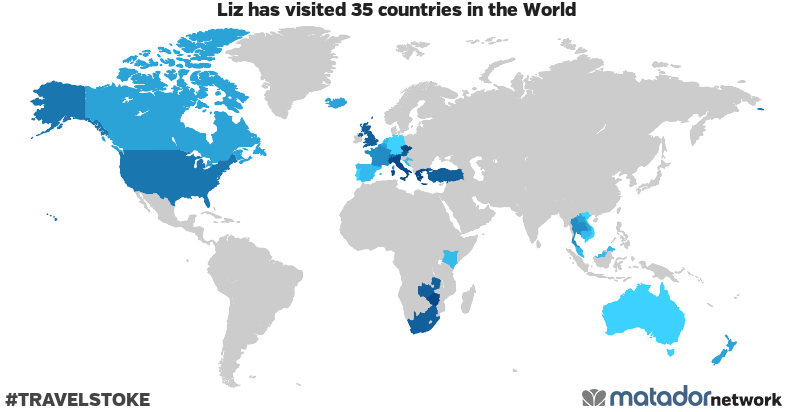 Liz has been to: Antigua and Barbuda, Austria, Australia, Barbados, Belgium, Canada, Switzerland, Czech Republic, Germany, Dominica, Spain, France, United Kingdom, Greece, Croatia, Iceland, Italy, Kenya, Cambodia, Saint Kitts and Nevis, Laos, Malaysia, Netherlands, New Zealand, Portugal, Singapore, Sint Maarten, Thailand, Turkey, United States, Vatican, Vietnam, South Africa, Zambia, Zimbabwe. OK, yes, it is partially cheating to post this, but I think these Matador Network Maps are a great way to keep a record of all the countries that you’ve visited, and also to see just how far around the world you have managed to travel. I’m super lucky, I’m only 25 and have visited this many countries, but I can’t help but look at this and see the blank spaces and the greyed out gaps. Travelling is the ultimate escape from everyday life. Travel is the ultimate quest that goes some way to satisfy the thirst for knowledge. Travel broadens the mind and senses. Travel is just blooming brilliant! This is an impossible question. To start with, I have a truly unrivalled love for my home city: Liverpool. A few months a go I wrote about all the best places to visit, eat, and see which can be found here. I don’t think I have an actual favourite country, but I would definitely put Canada, Iceland, Kenya, Malaysia, and New Zealand as the top contenders. They are incredibly varied, and all have their own unique qualities, but as a Geographer, they just boast an unrivalled amount of culture, food, and incredible landscapes. I think, more than any other countries that I have visited already, these would be the ones that I would be most disappointed if I never went back to. And as for cities, well, I’d put Kuala Lumpur, Chicago. San Diego, Florence, and Dubrovnik up in the list. I may say I am not that into my history, but these cities all boast impressive buildings and old towns, and all have eclectic tastes in food, cultures, and people. I like things to do in a city, places to visit, nooks and crannies to explore, and I like getting lost without losing where you are, and these cities all offer that in abundance! I’m lucky that I’ve done a while host of different things while travelling, that (again!) narrowing it down to one thing is going to be almost impossible. I’ve made lots of brilliant memories from my travels all around the world, but I think living abroad gives you the best sense of the local life, and living in Thailand is where I had some of my most memorable experiences. From being bitten by a monkey to blessed by monks, learning to deep dive to riding side saddle on a motorbike, teaching young children to speak English while desperately trying to understand Thai food, culture, and most of all language. Living abroad is an unrivalled experience that I would recommend to anyone who gets the opportunity. Many of my favourite things that I have weren’t purchased but gifted abroad. I like to have a physical memory of my favourite places, so the best things that I have ever purchased abroad are my souvenirs. There are far too many to name, but they vary from baseballs to Buddhas, and boomerangs to bags, and the are dotted all over my house. I also purchased Harry Potter and the Half Blood Prince in Austria, after hunting high and low for and English printed bookshop. I was rewarded with the book and an awesome Harry Potter collector’s bag. Advice for those who want to travel but think they can’t? Enjoy looking for places that you think you may want to visit. Take the time to research the best attractions, the top/affordable places to eat and drink. Download/print/read guidebooks and maps so you feel comfortable enough that you can find the information you may need while you’re there. Find a travel buddy who is either more experienced or less reserved to help you take the plunge. And finally…. ….just do it. Take that step, dive into the unknown. The worst thing that can happen is you realise that it’s not for you and you can catch the next plane/train/automobile back to the safety of your home. But if you like it, well, it will simply change you life! Travel accessory you always pack? For me, as a fair skinned red head, will always pack sun protection. Nothing ruins nights out, sightseeing, sunbathing, activity days, and all round enjoyment like sunburn. A comfy pair of shoes: blisters, much like sunburn, are mood-killers. A comfy pair of shoes lets you walk the sites, explore hidden gems, and not worry about racing home to rest those little tootsies before you go out to do it again. A credit card. Let me tell you, when you’re there and you look at that ‘thing’ and you think, can I really afford that, just think ‘it’s probably more affordable to put it on the card now than save to pay to come back’. A credit card can save your skin if you find yourself in a pickle, it can let you do the things that you never thought you could, and it gives you a level of security and freedom that let’s you get on with your holiday/travelling without any worries! I’d love to hear your answers and thoughts! Thanks, it was a really good tag so I couldn’t resist! Happy exploring!